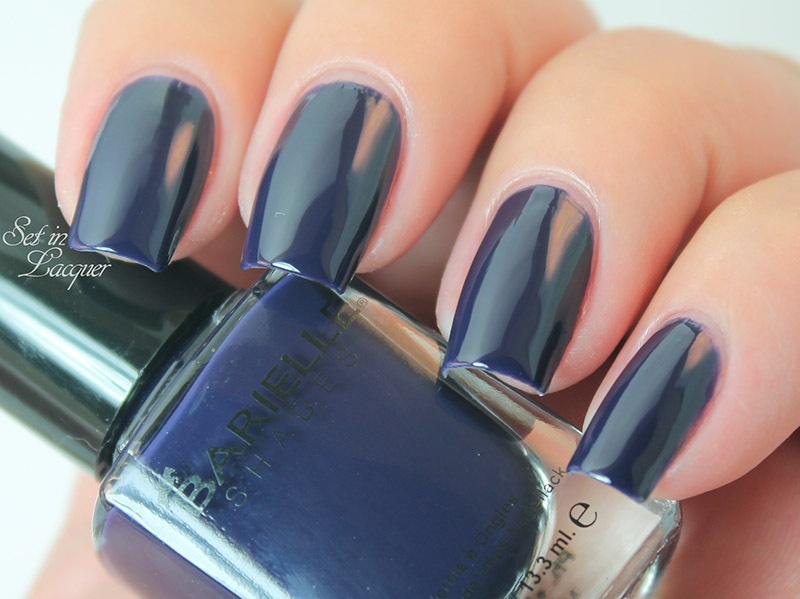 Did you know Barielle began its voyage into the nail polish world by creating products to condition the hooves of million-dollar thoroughbred racehorses? So if those owners of those elite and graceful animals trusted the product I know I can too. Actually, Barielle is one of my favorite brands. It's formula is usually spot on. The Gentle Breeze Collection has five gorgeous, rich shades. The Gentle Breeze Collection for Spring 2015 reflects the soft, gentle and eclectic hues of spring. Let's take a look! These swatches are shown with two coats and a top coat. Heaven Sent is a soft aquamarine blue creme. This light blue with a hint of green tone will be perfect for those warmer weather manis. This is two coats with a top coat. Champagne Bubbles is a brown leaning tangerine creme. It is subtly classy and is perfect as a base for nail art or on its own. This is two coats with a top coat. Pink Parasol is a described as a strawberry ice; however I think it is the perfect bubble gum pink. This is two coats with a top coat. Gray Sky is a glacier gray creme polish with a hint of shimmer. This is three coats with a top coat. Under the Sea is a sea blue shimmer polish. 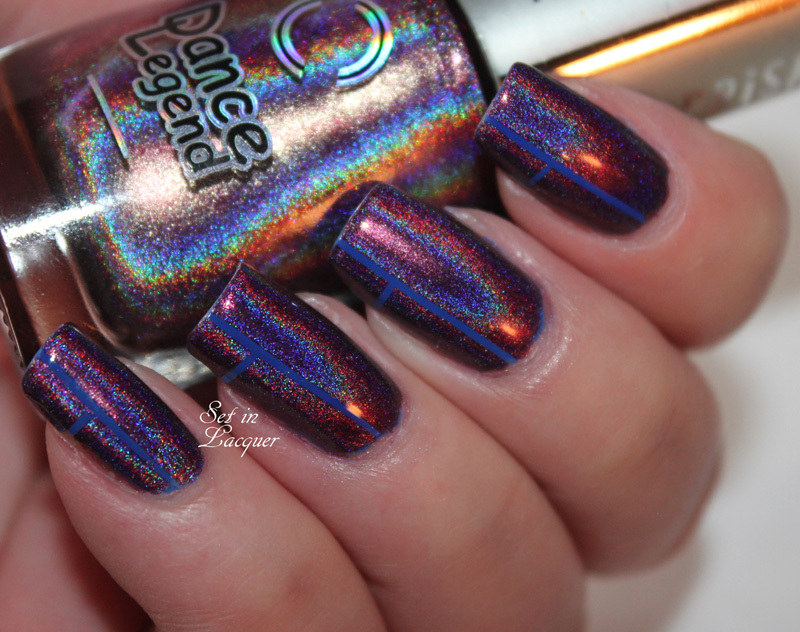 The shimmer is obvious without being over-the-top. It's a classy spring shade. This is two coats with a top coat. Did you know Barielle got its beginning by creating products to condition the hooves of million-dollar thoroughbred racehorses? So if those owners of those elite animals trusted the product I think I can too. Actually, Barielle is one of my favorite brands. It's formula is usually spot on. The Me Couture collection has six gorgeous, rich shades. The Me Couture Collection for Fall 2014 embraces the high fashion colors for the season. It has a sophisticated palette combination of retro and intense shades. Let's take a look! These swatches are shown with two coats and no top coat. Berry Posh is a creamy rich fuchsia shade. It is a deep shade that will look perfect with sweater and boots; but will be perfect for any season. It dries to a high-gloss shine. I had no application issues with this shade. Boho Chic is described as a creamy deep, sea green shade. Although, I am not sure that description is spot on. But quite honestly, I can't think of another way to describe it - except that it is rich and luscious. I had no application issues with this polish. Moda Bleu is a creamy, dark navy blue shade. I think it leans toward purple. But it dries to a high-gloss shine and is my favorite of the collection. It's definitely an eye-catcher. I had no application issues with this polish. Soho at Night is a rich creamy grape shade of purple. It dries to a high-gloss shine and the deep color is simply stunning. I had no application issues with this shade. Taupe Notch is described as a dark taupe cream polish. I think it is more of a slate gray. Either way, it is a stunning, classic shade. I had no issues with application. Vintage Gown is a creamy rust shade with a subtle hint of pink shimmer. It is gorgeous, classic and perfect to wear to any event. I had no application issues with this shade. Which of these polishes is your favorite? They are all stunning and I had no issues with application. You can buy these polishes at Barielle.com for $8 each. 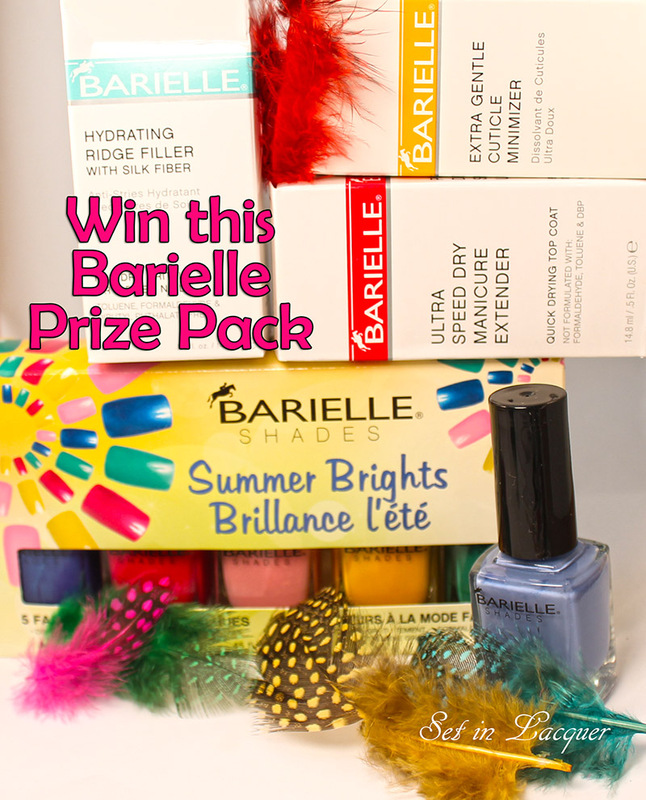 Make sure to follow Barielle on their Facebook page to keep up with collections and sales. 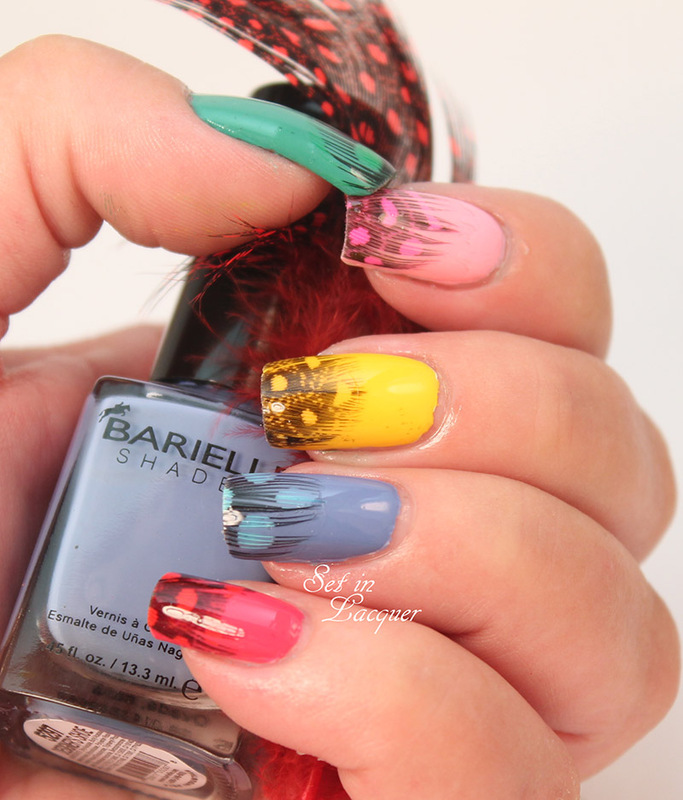 Today's post features a summer infused skittle mani with feathers. Who knew it could be so much fun? It's vibrant, dimensional and ready to take flight! 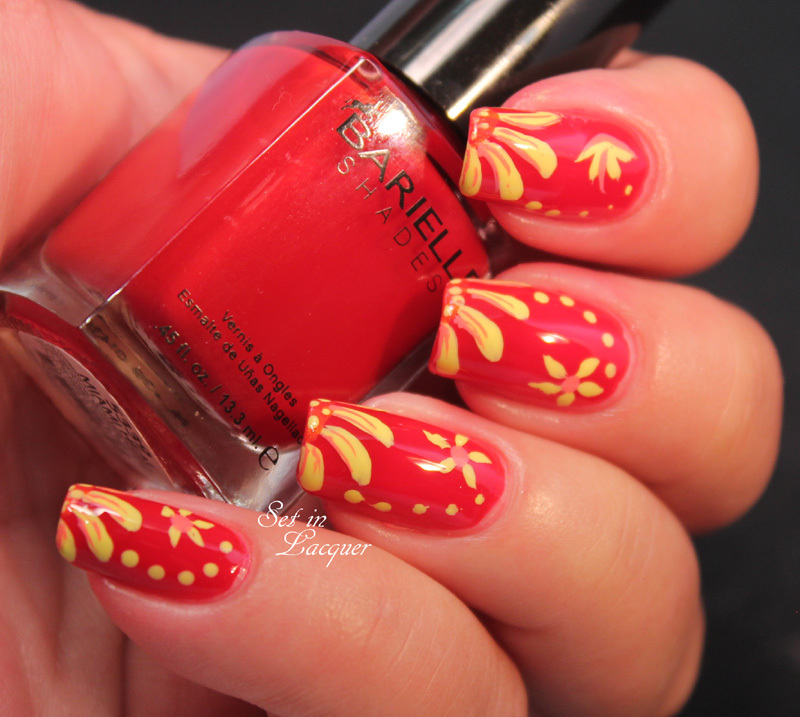 The Barielle Summer Brights collection is perfect for this nail art. Vibrant colors are always a hit for the summer. And as summer is rapidly coming to an end, I had to create something fun and bright. 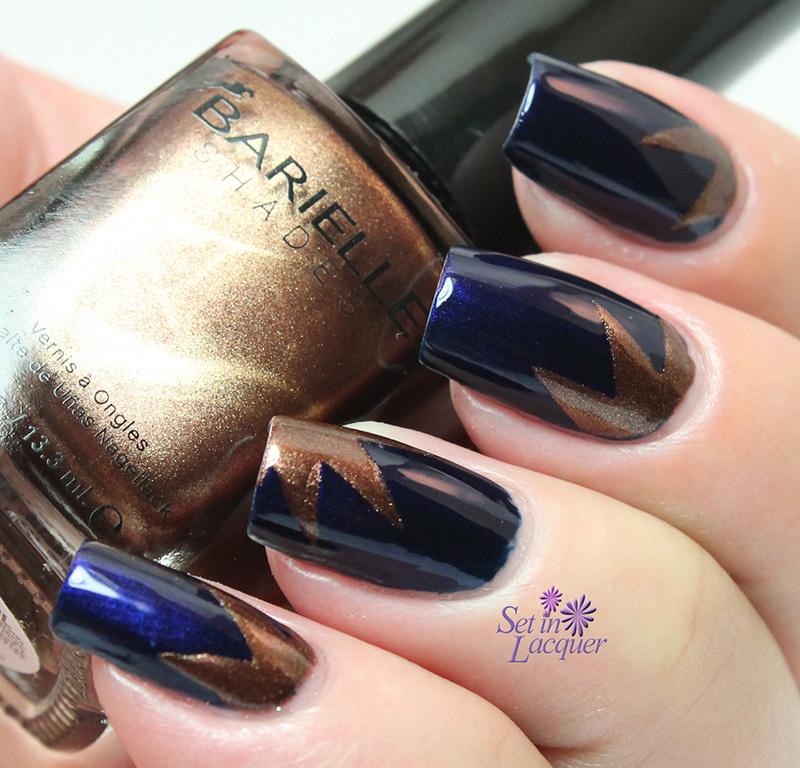 To prep my nails for this nail art I used Barielle Extra Gentle Cuticle Minimizer. It works wonders and leaves behind a clean, smooth nail border. Then I applied a base coat of Barielle Hydrating Ridge Filler. This is my favorite ridge filler. It applies smoothly and doesn't leave behind a white tinge like so many of the others do. And it fills ridges in one easy swipe. I applied Lemondrops (bright yellow), Sweet Addiction (grass green), Cosmic Kiss (hot pink), Designer's Shoe (sky blue), and Pink Flip Flops (soft pink) to my nails. I let them dry and applied a top coat (don't use a quick dry for this step.) Moving rather quickly, I applied the tip of a feather to each nail and pressed down until it adhered to the nail. Then I snipped of the feather with scissors at the tip of the nail. 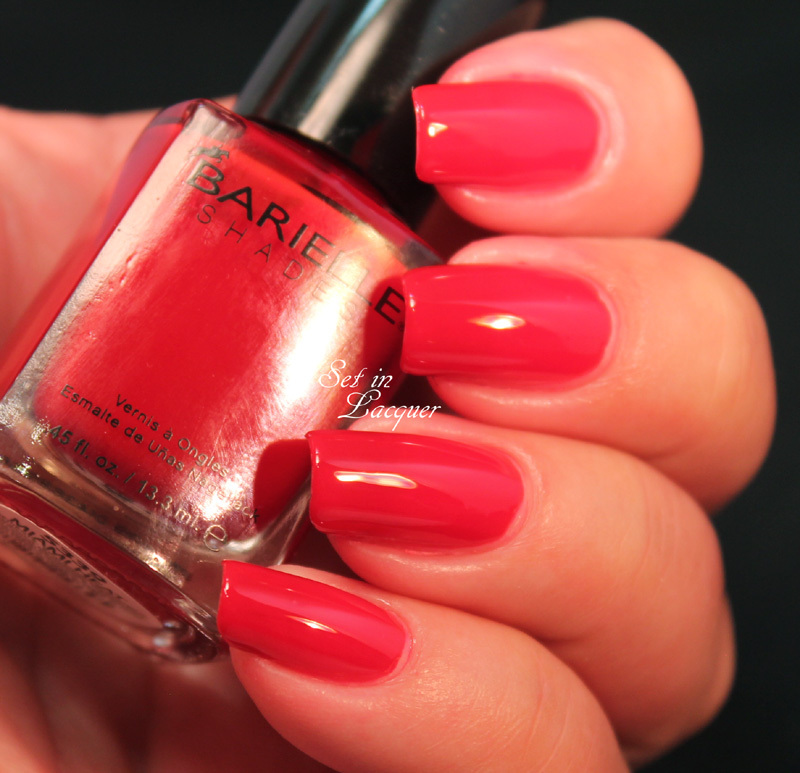 I applied a top coat of Barielle Ultra Speed Dry Manicure Extender to each nail. I let it dry for about 5 minutes to ensure it was completely hardened and added another coat. You want to make sure the feather is completely coated. After it was completely dry, I used a file and filed off the edges of the feather that were hanging over the edge of the nail. Then I added a bit of top coat to the tip of the nail to seal it completely. Now here's the exciting part! 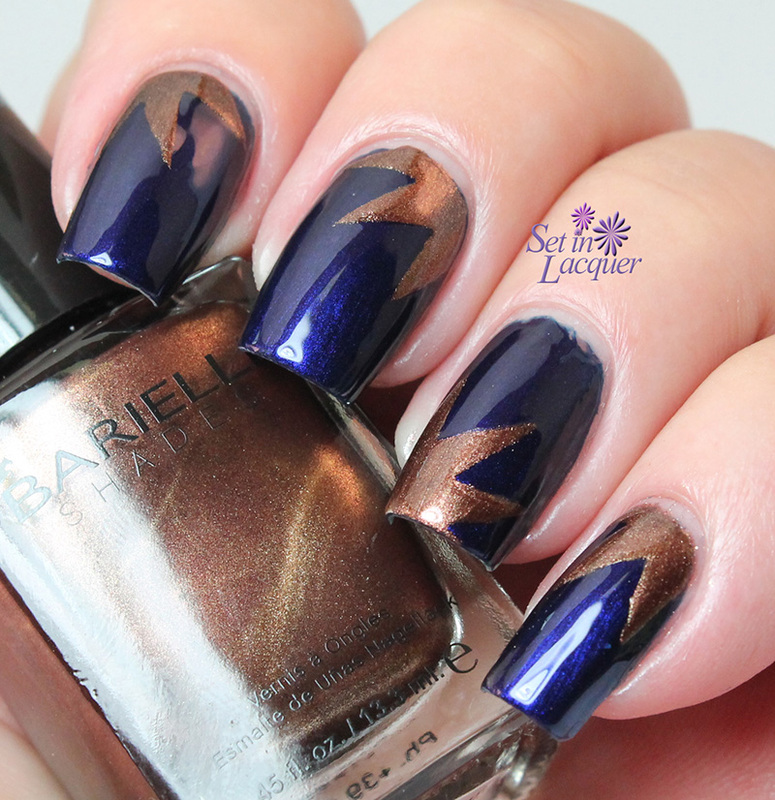 Barielle has provided everything used in this mani for a giveaway. And I am even going to add the feathers! 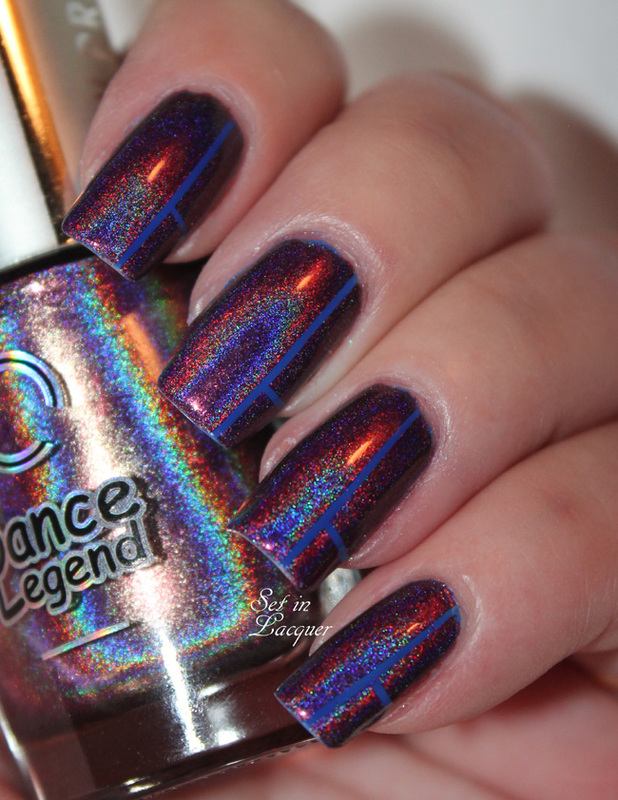 So one lucky reader will win everything needed to recreate this mani! This giveaway is open to international readers (please make sure you know your countries postal regulations as I am not responsible for it being damaged or stopped in transit.) and entrants must be 18 years of age or older (or have parental permission). The giveaway will end at midnight (mountain daylight saving time) on September 2, 2014. Did you know Barielle got its beginning by creating products to condition the hooves of million-dollar thoroughbred racehorses? So if those horse owners trusted the product I think I can too. Actually, Barielle is one of my favorite brands. It's formula is usually spot on. This collection definitely meets my expectations. Let's take a look at these pastel beauties. Designer's Shoe is a gorgeous pastel lilac shade. It applied famously and dried relatively quickly. I love this shade. Usually this type of color doesn't go too well with my skin tone. But this has enough of a blue tint that it works. This is two coats. 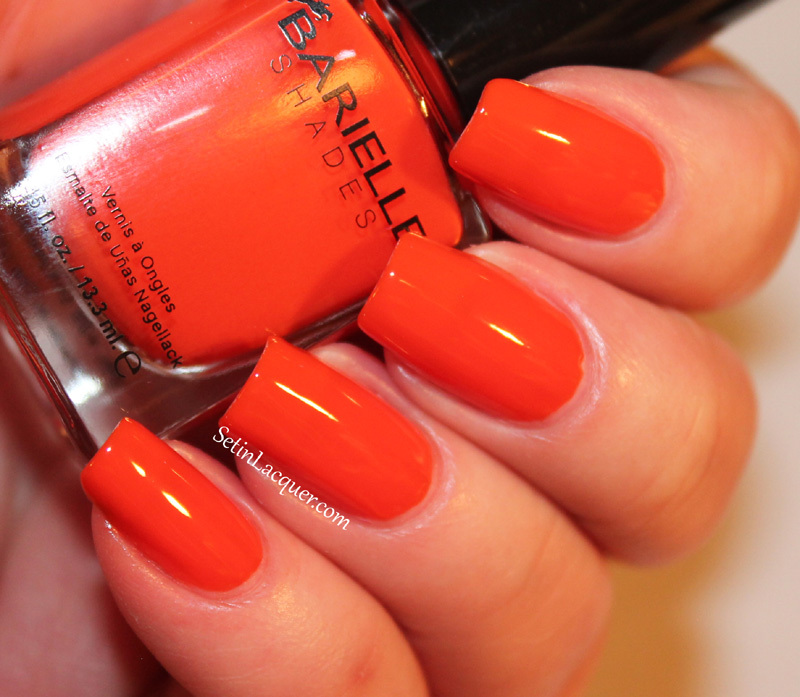 Fire Me Up is a stunning reddish orange shade. It's not quite a pastel, but it's definitely fits the bill for Spring! 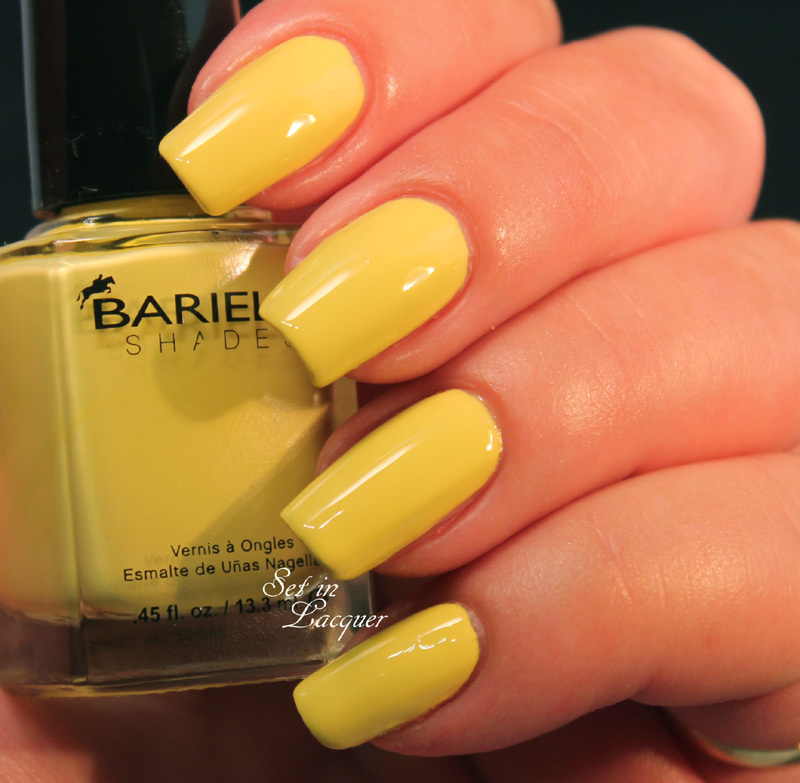 This shade is sure to wash away the Winter doldrums and fire up some Spring in your life. This is two coats. First Class Ticket is my favorite of the collection. This gorgeous periwinkle blue will get rid of those Winter Blues. This is two coats. Money Talks is a gorgeous mint green cream polish. It was a bit persnickety to apply though. It seemed a bit thick and it didn't want to self-level. But after applying Seche Vite top coat it looked pretty good. This is three coats. My City Apartment is a stunning shade of a light slate gray. It's perfect on its own or as a base for nail art. This is two coats. Take Me Shopping is another one of my favorites from the collection. 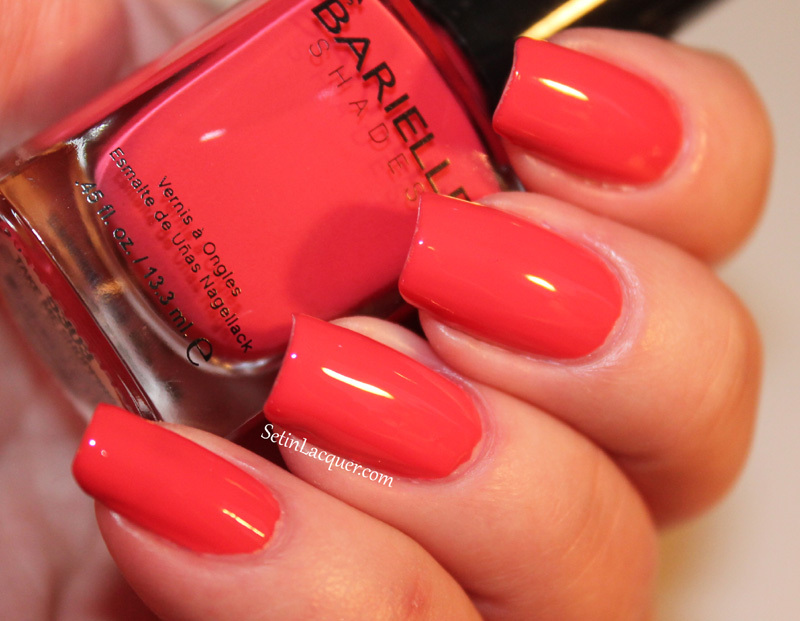 This deep coral rose shade is vibrant and classy. Which of these polishes are you going to snag? You can buy these polishes at Barielle.com for $8 each. 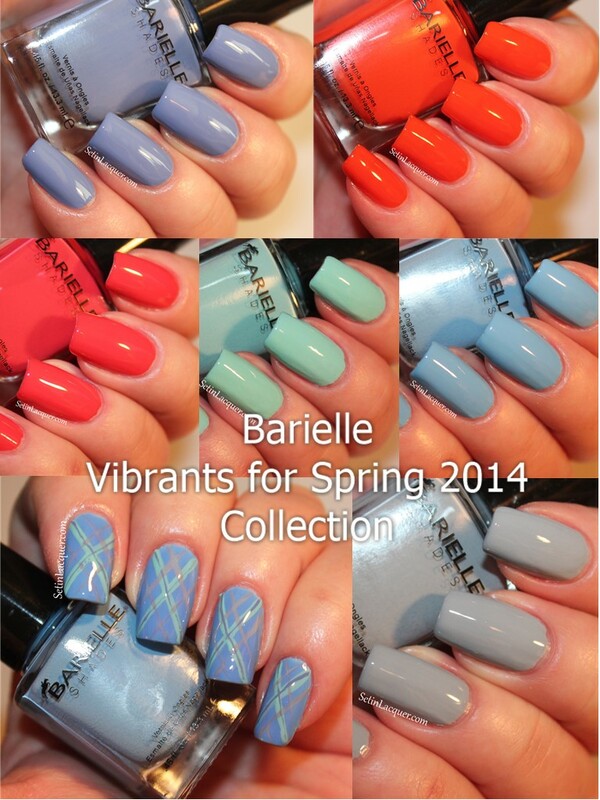 Make sure to follow Barielle on their Facebook page to keep up with collections and sales.